Soon after the new year is when many cigar manufacturers announce price increases, so the spring seems like an appropriate time to consider some ways to stretch your cigar budget. To that end, here are a few suggestions for ways I’ve gotten more cigars for less without having to cut back on enjoyment. Go low. Try some of the lower-priced entries from quality manufacturers. But not just any of them. Look for cigars you enjoy that the big online retailers frequently mark down as come-ons. Two that I almost always keep in my humidor are Perdomo’s Lot 23 Robusto and Holt’s Old Henry Robusto, a house brand made by My Father Cigars for the Philadelphia-based retailer. Lot 23 Robustos can almost always be found for around $4.50 each by the box, but 5- and 10-packs show up on sale at considerably less. Holt’s usually offers Old Henry Robustos at $4 apiece by the box of 25. But they almost always have a freebie attached that lowers the per-stick cost even more. Sometimes it’s a sampler pack, though lately it has been a triple-flame torch lighter. Look for a new look. Keep abreast of manufacturers changing the look of their cigars. A redo in packaging often means big price reductions on the cigars with the old look that are still on tobacconist shelves. Retailers need to move them so they can display the latest incarnation. I got terrific bargains on numerous old Avo vitolas when Davidoff discontinued some and dressed the others in new bands and boxes. A similar situation developed when Davidoff redesigned the Camacho line a couple of years ago. Back of the pack. 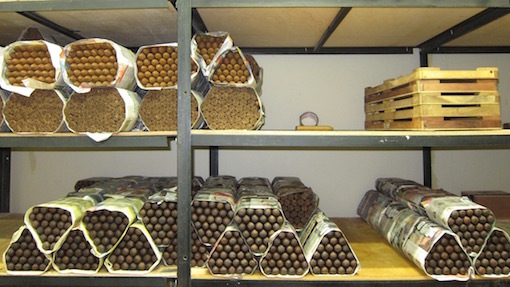 If your tobacconist has a discount table or holds periodic sales, be prepared beforehand. You can do this by keeping an eye on what cigars aren’t selling. In other words, don’t look just for what’s new. Look for what’s old. Try one and, if you like it, watch for them to hit the bargain bin. I recently scored a box and a half of La Jugada Habano Double Coronas at half price. I knew I liked La Jugada with some age, and I’d have been willing to keep them for a while. But in this case, I not only got a bargain, but the tobacconist had kindly aged them for me because they’ve been sitting on the shelf for close to two years. So, what tips and tricks do you have to save money on cigars? Share the wealth so we can all do better. http://www.stogieguys.com/2012/12/11022012-quick-smoke-rocky-patel-r4-double-corona-aged.html and wasn’t a fan. But other smokers may enjoy it, and now, over three years later, the price remains as low as it was. Personally, I find Famous Smoke Shop’s “Famous Buenos Maduritos” a great bargain at about a buck a stick. Certainly nothing like the much higher-priced sticks, but for an everyday smoke I haven’t found a better value. But I am always seeking.